The political context in which corruption is understood and managed has seen a fundamental transformation from the first steps to redefine the political response to corruption by the U.S. and its Foreign Corrupt Practices Act in the 1970s, to the embrace of global normative political anti-corruption rules in the form of the OECD's Anti-Bribery Convention and the UN Corruption Convention. And, indeed, it may well be the multilateralism and consensus inherent in the rise of international frameworks for anti-corruption standards and structures that might be an important element in further development. "The UK Bribery Act and the Foreign Corrupt Practices Act (FCPA) in the US started a trend that has spread across the globe, including Latin America, to crack down on corruption. Anti-bribery laws and enforcement efforts attract business from multinational companies that may be less inclined to do business in countries deemed unsafe. . . . .Perhaps part of the growth of local anti-corruption efforts stems from the apparent cooperation of foreign and Latin American authorities to root out corruption." (Anti-corruption trends across Latin America). 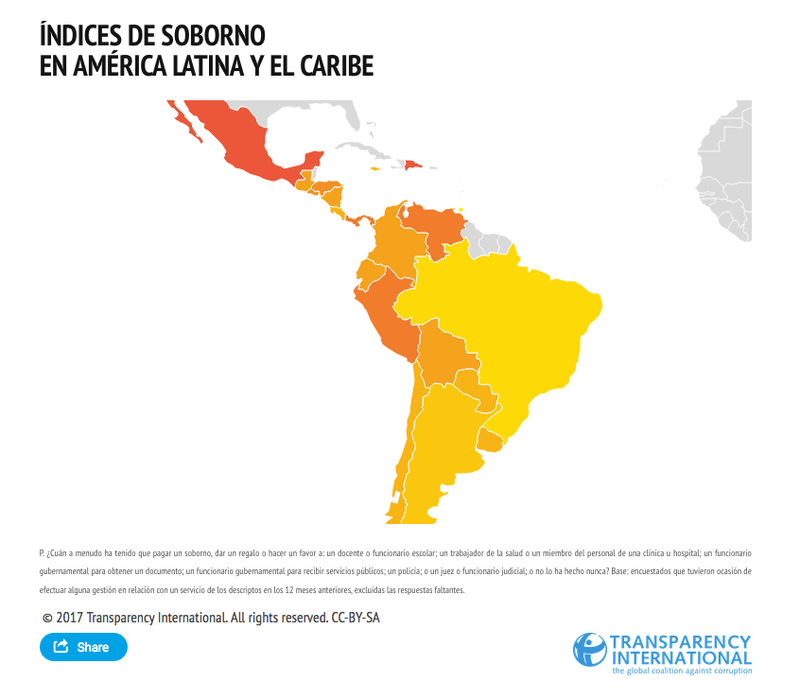 Almost two thirds of people that we surveyed for the latest Global Corruption Barometer, People and Corruption: Latin America and the Caribbean, said that corruption had risen in the 12 months prior to when they were questioned (62 per cent). More than half said that their government is failing to address corruption (53 per cent). And one in three people who had used a public service in the last 12 months said they had to pay a bribe (29 per cent). We talked to more than 22,000 people in 20 countries. It’s no surprise then that across the region people regularly take to the streets to protest corruption. We’ve seen it in Brazil, Guatemala and the Dominican Republic. We’ve seen it in Mexico and Honduras. In fact seven in ten citizens stand ready and willing to get involved in the fight against corruption (70 per cent). Yet despite this, few bribe payers said that they had actually reported this to the authorities (9 per cent), and of those who do, almost one third said that they suffered negative retaliation as a result (28 per cent). (Corruption on the rise in Latin America and the Caribbean). For all that, change appears to be coming to Latin America. This post looks to two--the adoption of new anti-corruption statutes in Argentina and Perú. Argentina enacted Law 27.401, which will enter into force in March 2018. Parú enacted into force Law 30424. The texts of the new statutes follow (Spanish) along with commentary (English) for the Argentine statute (Jorge and Basch: In Argentina, a new statute on corporate criminal liability for corruption) and Perú (Sandra Orihuela: Amid Odebrecht fallout, Peru enacts world-class anti-bribery law) both published in The FCPA Blog. These efforts join similar initiatives in Mexico (2017), Columbia (2016), Chile (2013), Brazil (2013), Uruguay (1998). Argentina is particularly interesting because in addition to its new statute, it has sought to apply the system of governance through administrative discretion manifested in systems for the management of the exercise of prosecutorial discretion (Jorge and Basch: Argentina introduces deferred prosecution agreements, standards for compliance programs). This has application potentially in China as well (my thoughts here). Other states are still a work in progress, though they have been moving toward embracing international standards: e.g., Paraguay. On December 1, the Argentine government enacted Law 27.401, which will enter into force in March 2018. We were deeply involved in the drafting and debate of the statute. In this post and the next one, we'll summarize some of the key features of the new law. Which legal entities are subjected to the new regime? Argentina Law Nº 27.401 (unofficial English translation here) establishes criminal liability for “private legal persons,” defined in the Argentine Civil Code. Notably, labor unions and their healthcare associations (“obras sociales sindicales”), professional associations and political parties are not considered “private legal persons” under Argentine law. Therefore, these entities are out of the new statute's reach. An aggravated form of misrepresentation in books and records specifically directed at concealing the commission of bribery or trading in influence offenses (art. 300 bis of the Criminal Code). Notably, these offenses do not have a minimum threshold, making legal persons liable regardless of the significance of the prohibited transaction. Standards of Liability. The Argentine private sector strongly advocated for a standard of liability based on organizational failure. But consistent with the existent regime for other crimes, the law creates a standard of strict liability: legal persons are liable for the aforementioned crimes committed, directly or indirectly, with their intervention or in their name, interest or benefit (Article 2). This approach is consistent with the standard of corporate liability already in force for other crimes, such as custom’s crimes, tax crimes, money laundering, insider trading, and securities fraud, among others. The individual offenders may be employees or third parties -- even unauthorized third parties, provided that the legal person ratified the act, even tacitly. Therefore, the statute creates a need for robust due diligence, monitoring, and management programs over business partners and other third parties. The statute also establishes successor liability in cases of merger, acquisition or other forms of corporate transformation. Therefore, integrity due diligence will also become an important part of any M&A transaction. Defenses. Strict liability is mitigated somewhat by what we called "organizational merit," which can offset organizational failure. Since these three conditions are concurrent, the law is more demanding than the models based on “organizational failure” (Chile, United Kingdom, Spain), where adequate procedures alone are enough for a full defense. In the next post, we'll talk about deferred prosecution agreements under the new law, as well as penalties and other sanctions for offense, aggravating and mitigating factors, mandatory compliance programs for some contracts with the national government, and components of an "adequate" compliance or integrity program. Guillermo Jorge, pictured above left, (gjorge@glatam.com.ar) and Fernando Basch, right, (fbasch@glatam.com.ar) are partners at Governance Latam, an advisory firm based in Buenos Aires www.glatam.com.ar. Peru welcomed the new year by enacting into force Law 30424, which introduces corporate criminal liability applicable to bribery. Peruvian law now recognizes the independent criminal liability of a legal person for local and foreign bribery, imposing sanctions ranging from fines, debarment from government contracting to dissolution of the legal entity. This is aligned with the U.S. standard of respondeat superior applicable to the FCPA and other offenses, in that corporate entities face criminal liability for the illegal conduct of their employees or agents when acting within the scope of their employment or agency, and when such illegal conduct was intended to provide, at least in part, a benefit to the corporate entity. Responding primarily to its accession efforts before the OECD and to other international commitments, at the beginning of 2017 Peru broadened the corporate liability applicable to legal entities by way of Law Decree 1352, giving corporations a full year to transition into the heightened requirements. The country’s objective is to comply with its international agreements and to improve its legal framework by introducing a new system of administrative liability to regulate the autonomous liability of the legal person when involved in bribery related offenses, including money laundering and terrorism financing. While the new law is a step forward in the fight against corruption, it comes at a time when Peru is facing some of its worst corruption scandals and the country appears overwhelmed in a state of disruption resulting from corruption. Former presidents serving during the last 17 years are accused of alleged involvement in some form of corruption, the most recent of which narrowly avoided President Kuczynski’s removal from office before Christmas on the grounds that he was “morally handicapped” to serve as president after admitting he had received advisory fees from Odebrecht while he served as Peru’s economy minister and prime minister. Several government officials, politicians, well known private citizens and executives are being subject to prosecution and face bribing, corruption or money laundering charges. This has caused disruption at all levels of government and society. Now the corporate tier faces additional scrutiny. It applies to all forms and size of legal entities, private and public, including de facto legal entities such as associations, committees and irregular entities. It applies independently to the legal entity and does not require the act or conduct of an individual to trigger the corporate criminal liability. It applies to local and foreign bribery of public officials as provided in the criminal code; to money laundering, terrorism financing and to other illicit acts (i.e. illegal mining) pursuant to specific law. Penalties and sanctions are to be applied on the basis of the benefit derived from the bribery and the annual income of the legal entity. Legal entities can be subject to compulsory intervention or supervision, as well as to a stay of sanctions and fines for a period of up to two years (which appears analogous to the DPAs and NPAs of the U.S. but is subject to regulations not yet enacted). Mitigating factors include substantial cooperation, reparation, the existence of an “adequate” corporate compliance program (called “preventive compliance model”), to the adoption and implementation of the compliance program following the crime but before sentencing. Continuous Improvement, Testing and Review. These are subject to further detail by way of the pending regulations. Not without criticism and its own challenges -- primarily related to the yet to be published regulations and the designation of the securities regulator to determine the adequacy of the corporate compliance program -- the newly imposed corporate criminal liability is part of Peru’s new chapter in the globalization of its anti-corruption efforts. 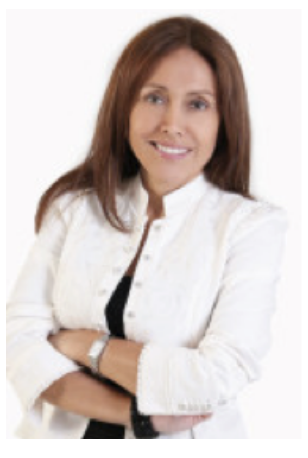 Sandra Orihuela, pictured above, is a U.S. and Peru licensed attorney and founder of a legal boutique specializing in international business transactions primarily involving Latin America, with a special emphasis on corporate governance, anti-bribery and compliance. She can be contacted here. La presente Ley regula la responsabilidad administrativa de las personas jurídicas por el delito de cohecho activo transnacional previsto en el artículo 397-A del Código Penal. Para efectos de la presente Ley, son personas jurídicas las entidades de derecho privado, así como las asociaciones, fundaciones y comités no inscritos, las sociedades irregulares, los entes que administran un patrimonio autónomo y las empresas del Estado peruano o sociedades de economía mixta. El cambio de nombre, denominación o razón social, reorganización social, transformación, escisión, fusión, disolución, liquidación o cualquier acto que pueda afectar la personalidad jurídica de la entidad no impiden la atribución de responsabilidad a la misma. a. Sus administradores de hecho o derecho, representantes legales, contractuales y órganos colegiados, siempre que actúen en el ejercicio de las funciones propias de su cargo. b. Las personas naturales que prestan cualquier tipo de servicio a la persona jurídica, con independencia de su naturaleza, del régimen jurídico en que se encuentren o de si media relación contractual y que, estando sometidas a la autoridad y control de los gestores y órganos mencionados en el literal anterior, actúan por orden o autorización de estos últimos. c. Las personas naturales señaladas en el literal precedente cuando, en atención a la situación concreta del caso, no se ejerza sobre ellas el debido control y vigilancia por parte de los administradores de hecho o derecho, representantes legales, contractuales u órganos colegiados de la persona jurídica. Las personas jurídicas no son responsables en los casos en que las personas naturales indicadas en los literales a, b y c del primer párrafo, hubiesen cometido el delito de cohecho activo transnacional, previsto en el artículo 397-A del Código Penal, exclusivamente en beneficio propio o a favor de un tercero distinto a la persona jurídica. La responsabilidad administrativa de la persona jurídica es autónoma de la responsabilidad penal de la persona natural. Las causas que extinguen la acción penal contra la persona natural no enervan la responsabilidad administrativa de las personas jurídicas. La acción contra la persona jurídica se extingue por prescripción, cosa juzgada, amnistía o el derecho de gracia. La prescripción de la acción contra la persona jurídica se rige por lo dispuesto, en lo que corresponda, en los artículos 80, 82, 83 y 84 del Código Penal. a. Multa hasta el séxtuplo del beneficio obtenido o que se espera obtener con la comisión del delito, sin perjuicio de lo dispuesto en el literal a del primer párrafo del artículo 7. 1. Suspensión de las actividades sociales por un plazo no mayor de dos años. 2. Prohibición de llevar a cabo en el futuro actividades de la misma clase o naturaleza de aquellas en cuya realización se haya cometido, favorecido o encubierto el delito. La prohibición podrá tener carácter temporal o definitivo. La prohibición temporal no será mayor de cinco años. 3. Suspensión para contratar con el Estado por un plazo no mayor de cinco años. c. Cancelación de licencias, concesiones, derechos y otras autorizaciones administrativas o municipales. d. Clausura de sus locales o establecimientos, con carácter temporal o definitivo. La clausura temporal es no mayor de cinco años. El juez puede ordenar a la autoridad competente que disponga la intervención de la persona jurídica que resultare administrativamente responsable de la comisión del delito de cohecho activo transnacional, cuando sea necesario, para salvaguardar los derechos de los trabajadores y de los acreedores hasta por un período de dos años. La intervención puede afectar a la totalidad de la organización o limitarse a alguna de sus instalaciones, secciones o unidades de negocio. El juez debe fijar exactamente el contenido y alcances de la intervención y determinar la entidad a cargo de la intervención y los plazos en que esta debe cursarle informes a fin de efectuar el seguimiento de la medida. La intervención se puede modificar o suspender en todo momento previo informe del interventor y disposición del Ministerio Público. El interventor está facultado para acceder a todas las instalaciones y locales de la entidad y recabar la información que estime necesaria para el ejercicio de sus funciones, debiendo guardar estricta confidencialidad respecto de la información secreta o reservada de la persona jurídica, bajo responsabilidad. a. Cuando el ingreso anual de la persona jurídica al momento de la comisión del delito asciende hasta ciento cincuenta unidades impositivas tributarias, la multa es no menor de diez ni mayor de cincuenta unidades impositivas tributarias. b. Cuando el ingreso anual de la persona jurídica al momento de la comisión del delito asciende hasta mil setecientas unidades impositivas tributarias, la multa es no menor de cincuenta ni mayor de doscientas cincuenta unidades impositivas tributarias. c. Cuando el ingreso anual de la persona jurídica al momento de la comisión del delito asciende a un monto mayor a las mil setecientas unidades impositivas tributarias, la multa es no menor de doscientas cincuenta ni mayor de quinientas unidades impositivas tributarias. La multa debe ser pagada dentro de los diez días hábiles de pronunciada la sentencia que tenga la calidad de consentida o ejecutoriada. A solicitud de la persona jurídica y cuando el pago del monto de la multa pueda poner en riesgo su continuidad o el mantenimiento de los puestos de trabajo o cuando sea aconsejable por el interés general, el juez autoriza que el pago se efectúe en cuotas mensuales, dentro de un límite que no exceda de treinta y seis meses. En caso de que la persona jurídica no cumpla con el pago de la multa impuesta, esta puede ser ejecutada sobre sus bienes o convertida, previo requerimiento judicial, en la medida de prohibición de actividades de manera definitiva, prevista en el numeral 2 del literal b del artículo 5. La medida de suspensión para contratar con el Estado, prevista en el numeral 3 del literal b del artículo 5, se impone de forma obligatoria en los casos en que el delito es cometido en el marco de un proceso de contratación pública. El juez puede imponer cualquier modalidad de inhabilitación en supuestos distintos al señalado en el primer párrafo, en atención a las particularidades del caso concreto y considerando los criterios establecidos en el artículo 14. La medida prevista en el literal c del artículo 5 se aplica de forma obligatoria cuando el delito de cohecho activo transnacional estuvo destinado o vinculado a la obtención de licencias u otras autorizaciones administrativas. Sin perjuicio de lo dispuesto en el primer párrafo, el juez puede imponer las medidas previstas en los literales c y d del artículo 5, en otros supuestos cuando lo estime pertinente en atención a los criterios establecidos en el artículo 14. La disolución se aplica solo a las personas jurídicas que hayan sido constituidas y operado para favorecer, facilitar o encubrir la comisión del delito de cohecho activo transnacional. En ningún caso podrá aplicarse para otras circunstancias. Esta medida no es aplicable cuando se trate de personas jurídicas de derecho privado y empresas del Estado o sociedades de economía mixta que presten un servicio de utilidad pública, cuya interrupción pueda causar graves consecuencias sociales o económicas o daños serios a la comunidad. El juez, cuando corresponda, dispone el decomiso de los instrumentos, objetos, efectos y ganancias del delito de cohecho activo transnacional por el que se declare responsable administrativamente a la persona jurídica, de conformidad con el artículo 102 del Código Penal, conjuntamente con las medidas administrativas del artículo 5 que resulten aplicables. a. Haber procedido a través de sus administradores de hecho o derecho, representantes legales, contractuales y órganos colegiados a confesar la comisión del delito de cohecho activo transnacional, con anterioridad a la formalización de la investigación preparatoria. b. La colaboración objetiva, sustancial y decisiva en el esclarecimiento del hecho delictivo, en cualquier momento del proceso. c. El impedimento de las consecuencias dañosas del ilícito. d. La reparación total o parcial del daño. e. La adopción e implementación por parte de la persona jurídica, después de la comisión del delito de cohecho activo transnacional y antes del inicio del juicio oral, de un modelo de prevención, conforme a lo dispuesto en el artículo 15.
f. La acreditación parcial de los elementos del modelo de prevención, previstos en el párrafo 17.2 del artículo 17.
a. La comisión del delito de cohecho activo transnacional en virtud de cualquiera de los supuestos del artículo 3, dentro de los cinco años posteriores a la imposición, mediante sentencia firme, de una o más medidas del artículo 5 a la misma persona jurídica. En tal caso, el juez puede aumentar las medidas establecidas en los literales a, b y d del artículo 5, hasta en una mitad por encima del máximo legal establecido. b. La utilización instrumental de la persona jurídica para la comisión del delito de cohecho activo transnacional. Se entiende que se está ante este supuesto cuando la actividad legal sea menos relevante que su actividad ilegal. a. La gravedad del hecho punible. b. El tamaño y naturaleza de la persona jurídica. c. La capacidad económica de la persona jurídica. d. La extensión del daño o peligro causado. e. El beneficio económico obtenido por el delito de cohecho activo transnacional. f. La modalidad y la motivación de la utilización de la persona jurídica en el delito. g. El puesto que en la estructura de la persona jurídica ocupa la persona natural u órgano que incumplió el deber de control. a. Identifica la extensión de la medida que corresponda, según los límites establecidos en el artículo 5, y la divide en tres partes. 1. Cuando concurran únicamente circunstancias atenuantes o no existan atenuantes ni agravantes, se aplica la medida dentro del tercio inferior. 2. Cuando concurran circunstancias agravantes y atenuantes, se aplica la medida dentro del tercio intermedio. 3. Cuando concurran únicamente circunstancias agravantes, se aplica la medida dentro del tercio superior. 4. Cuando se trate de circunstancias atenuantes previstas por la ley como privilegiadas, se aplica la medida por debajo del tercio inferior. 5. Cuando se trate de circunstancias agravantes previstas por la ley como cualificadas, se aplica la medida por encima del tercio superior. 6. En caso de concurrencia de circunstancias atenuantes privilegiadas y agravantes cualificadas, se aplica la medida dentro de los límites del rango legal. Para efectos del presente artículo, son circunstancias atenuantes privilegiadas aquellas previstas en la ley penal o procesal penal que prevean la reducción de la pena por debajo del mínimo legal. Del mismo modo, son circunstancias agravantes cualificadas aquellas previstas en la ley penal o procesal penal que prescriban el incremento de la pena por encima del máximo legal. 16.1. El juez puede, mediante resolución debidamente motivada y de modo excepcional, considerando especialmente el número de trabajadores o las ventas anuales netas o los montos de exportación de la persona jurídica, suspender la ejecución de las medidas administrativas impuestas y sus efectos por un plazo no menor de seis meses ni mayor de dos años. La suspensión procede siempre que la persona jurídica no esté incursa en el supuesto de reincidencia previsto en el literal a del artículo 13. 16.2. En el caso de empresas del Estado, sociedades de economía mixta o de personas jurídicas que prestan un servicio de utilidad pública cuya interrupción pueda causar graves consecuencias sociales y económicas o daños serios a la comunidad, el juez puede ordenar la suspensión, cualquiera fuese la medida administrativa impuesta en la sentencia. 16.3. Si durante el periodo de suspensión no se dispone la incorporación formal de la persona jurídica al proceso penal de conformidad con lo previsto en los artículos 90 y 91 del Código Procesal Penal, aprobado por el Decreto Legislativo 957, el juez deja sin efecto la medida administrativa impuesta y resuelve el sobreseimiento de la causa. 16.4. Esta suspensión no afecta el decomiso dispuesto judicialmente, según lo previsto en el artículo 11. 17.1. La persona jurídica está exenta de responsabilidad administrativa por la comisión del delito de cohecho activo transnacional, si adopta e implementa en su organización, con anterioridad a la comisión del delito, un modelo de prevención adecuado a su naturaleza, riesgos, necesidades y características, consistente en medidas de vigilancia y control idóneas para prevenir el delito de cohecho activo transnacional o para reducir significativamente el riesgo de su comisión. a. Una persona u órgano, designado por el máximo órgano de administración de la persona jurídica, que ejerza la función de auditoría interna de prevención y que cuente con el personal, medios y facultades necesarios para cumplirla adecuadamente. Esta función se ejerce con la debida autonomía respecto del órgano de administración, sus propietarios, accionistas o socios, salvo en el caso de la micro, pequeña y mediana empresa, donde puede ser asumida directamente por el órgano de administración. 1. La identificación de las actividades o procesos de la persona jurídica que generen o incrementen riesgos de comisión del delito de cohecho activo transnacional. 2. El establecimiento de procesos específicos que permitan a las personas que intervengan en estos, programar y ejecutar sus tareas o labores de una manera que prevenga la comisión del delito de cohecho activo transnacional. 3. La identificación de los procesos de administración y auditoría de los recursos financieros que permitan a la persona jurídica prevenir su utilización en la comisión de la conducta delictiva de cohecho activo transnacional. 4. La existencia de sistemas de denuncia, protección del denunciante, persecución e imposición de sanciones internas en contra de los trabajadores o directivos que incumplan el modelo de prevención. c. Un mecanismo de difusión y supervisión interna del modelo de prevención, el cual debe ser aprobado por un reglamento o similar emitido por la persona jurídica. 17.3. El reglamento desarrolla y precisa los elementos y requisitos necesarios para la implementación del modelo de prevención. 17.4. En el caso de las empresas del Estado o sociedades de economía mixta, el modelo de prevención se ejerce sin perjuicio de las competencias y potestades que corresponden a los órganos de control institucional como de todos los órganos conformantes del Sistema Nacional de Control. 17.5. Se excluye también la responsabilidad administrativa de la persona jurídica, cuando cualquiera de las personas naturales señaladas en el artículo 3 comete el delito eludiendo de modo fraudulento el modelo de prevención debidamente implementado atendiendo a los elementos previstos en el párrafo 17.2. El fiscal o el juez, según corresponda, verifican la efectiva implementación y funcionamiento del modelo de prevención. Si en el curso de las diligencias preliminares se acredita la existencia de un modelo de prevención implementado con anterioridad a la comisión del delito de cohecho activo transnacional, el fiscal dispone el archivo de lo actuado, mediante decisión debidamente motivada. En caso de que la investigación preparatoria se hubiese formalizado, el juez puede, a petición del Ministerio Público, dictar auto de sobreseimiento de conformidad con la normatividad procesal vigente. El modelo de prevención puede ser certificado por terceros debidamente registrados y acreditados, con la finalidad de acreditar el cumplimiento de todos los elementos establecidos en el párrafo 17.2 del artículo 17. El reglamento establece la entidad pública a cargo de la acreditación de terceros, la norma técnica de certificación y demás requisitos para la implementación adecuada de los modelos de prevención. La presente norma entra en vigencia el 1 de julio de 2017. El Poder Ejecutivo, dentro de los sesenta días hábiles siguientes a la publicación de la presente Ley, aprueba el reglamento a que hace referencia el párrafo 17.3 del artículo 17. La investigación, procesamiento y sanción de las personas jurídicas, de conformidad con lo establecido en la presente Ley, se tramitan en el marco del proceso penal, al amparo de las normas y disposiciones del Código Procesal Penal, aprobado por el Decreto Legislativo 957. Durante la investigación y proceso penal, la persona jurídica goza de todos los derechos y garantías que la Constitución Política del Perú y la normatividad vigente reconoce a favor del imputado. La persona jurídica puede ser asistida por la defensa pública, en caso lo requiera, bajo los alcances de la Ley 29360, Ley del Servicio de Defensa Pública, del Decreto Supremo 007-2012-JUS y demás normas conexas, en lo que resulte pertinente. Asimismo, son aplicables los artículos 372 y 468 al 471 del Código Procesal Penal, aprobado por el Decreto Legislativo 957, que regulan la conclusión anticipada del juicio y el proceso de terminación anticipada respectivamente, con plena intervención del apoderado judicial de la persona jurídica, y demás normas del citado código que resulten pertinentes. El Poder Judicial implementa un registro informático de carácter público para la inscripción de las medidas administrativas impuestas a las personas jurídicas, con expresa mención del nombre, clase de sanción y duración de la misma, así como el detalle del órgano jurisdiccional y fecha de la sentencia firme, sin perjuicio de cursar partes a los Registros Públicos para la inscripción correspondiente, de ser el caso. En caso de que las personas jurídicas cumplan con la medida administrativa impuesta, el juez, de oficio o a pedido de parte, ordena su retiro del registro, salvo que la medida tenga carácter definitivo. El Poder Judicial puede suscribir convenios con otras instituciones para compartir la información que conste en el registro. El Poder Judicial, en el plazo de noventa días hábiles contados a partir de la publicación de la presente Ley, emite las disposiciones reglamentarias pertinentes que regulen los procedimientos, acceso, restricciones, funcionamiento del registro y demás aspectos necesarios para su efectiva implementación. La Comisión de Alto Nivel Anticorrupción, a través de su Coordinación General, realiza campañas de difusión sobre los alcances de la norma, dirigida a las empresas, a la policía, a los fiscales, a los procuradores, a los jueces y a los ciudadanos. La implementación de lo establecido en la presente Ley se financia con cargo a los presupuestos institucionales de las entidades involucradas, sin demandar recursos adicionales al tesoro público. Cualquier propuesta normativa que modifique la presente Ley o que implique la reducción o ampliación de su objeto y alcances, cuenta para su aprobación con un informe técnico no vinculante de la Comisión de Alto Nivel Anticorrupción. En el supuesto de facultades delegadas a que se refiere el artículo 104 de la Constitución Política del Perú, el sector responsable solicita el referido informe técnico a la Comisión de Alto Nivel Anticorrupción. La presentación de denuncias maliciosas en el marco de la presente Ley da lugar a responsabilidad penal, civil, administrativa y disciplinaria, conforme a ley. Cuando las personas jurídicas señaladas en el artículo 2 de la Ley que regula la responsabilidad administrativa autónoma de las personas jurídicas por el delito de cohecho activo transnacional resulten responsables por el delito previsto en el artículo 397-A, el juez impone la medida de multa, conforme al literal a del artículo 5 de la citada norma, sin perjuicio de las demás medidas administrativas allí previstas que resulten aplicables”. a. Prohibición de actividades futuras de la misma clase o naturaleza de aquellas con cuya realización se habría cometido, favorecido o encubierto el delito. b. Suspensión para contratar con el Estado. La imposición de las medidas señaladas en el primer párrafo procede siempre que existan suficientes elementos probatorios sobre la responsabilidad administrativa de la persona jurídica por el delito de cohecho activo transnacional y que fuese indispensable para prevenir los riesgos de ocultamiento de bienes o de insolvencia sobrevenida o para impedir la obstaculización de la averiguación de la verdad. Estas medidas cautelares no duran más de la mitad del tiempo fijado para las medidas de carácter temporal previstas en el artículo 5 de la Ley que regula la responsabilidad administrativa autónoma de las personas jurídicas por el delito de cohecho activo transnacional”. En Lima, al primer día del mes de abril de dos mil dieciséis. Dado en la Casa de Gobierno, en Lima, a los veinte días del mes de abril del año dos mil dieciséis.